Now there is this cool Batman Logo’s Hoodie. You can get this Batman hoodie in red, blue, and black and in sizes Small – 2XL and it will look amazing on both men and women. On the hoodie you can see a yellow kind of fuzzy looking Batman logo but if you look closer you can see that it looks a little bit fuzzy because it is many of the Batman symbols in different styles all layered on top of each other. So when you wear this hoodie you can show a lot of different Batman logo’s without the whole hoodie being covered. Get ready for the holidays by dressing up in this Batman Logo Tree Christmas Sweater. The Batman Christmas sweater is unisex so will look great on both men and women. You can get this sweater in sizes Small – 2XL and in a bunch of colors. The Batman sweater also comes as a hoodie and t-shirt so that you really get what you need. On the Christmas sweater you can find a Christmas tree and the tree is made from green Batman logo’s and there are yellow ornaments on the tree too with the Batman logo and even the bucket the tree is in and the star on top have the famous Batman symbol on it. If you like Batman and need something cool to wear then check out this gray Batman logo hoodie. The Batman hoodie is light gray in color and shows in black the Batman logo as we know it from the Hush series. The hoodie has the nice big pocket on the front where your hands can together all warm and cozy. The black Batman logo on the front against the lighter gray background looks amazing and I am sure that people will love it on you. You can get this hoodie in men’s sizes Small – 2XL and it will look great on women too. Now Batman fans can be comfy while lounging at home all thanks to these comic style Batman pajama pants. These Batman lounge pants come in men’s sizes Small – 2XL and they are all made from preshrunk cotton. The pajama pants have two different designs on the legs as the left leg shows sound bubbles that say things like Blam!, Wham!, and Crash! and there is a the Batman logo on it too. On the other leg you can see Batman in an action scene. I am sure that a Batman fan would love to get a pair of Batman pajama pants like these and that means that it would be nice as a present for a true fan or yourself. 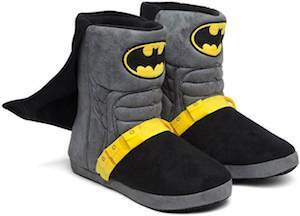 If you are a Batman with cold feet then you just need these Batman costume slipper boots. The slipper boots are made for adults and they come in a bunch of sizes for both men and women. The Batman slippers are costume boots that are black and gray and even have a cape and the Batman logo on the front. You can wear these cool slippers every night when you are at home or maybe you can even use them as part of your Batman Halloween costume. 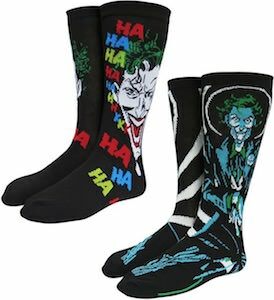 So get ready to have nice and warm feet and feel a lot more like Batman all by just wearing this footwear. If you need a warm head then check out this gray Batman beanie hat. This beanie hat is perfect for all the true Batman fans and that means you can get yourself one or as fun present for the true Batman fan in your life. 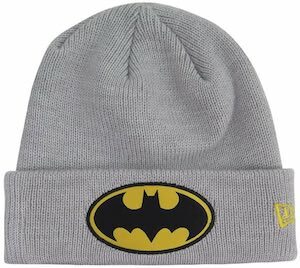 The beanie hat is light gray in color and on the cuff it shows the famous Batman logo in the oval shape with the yellow background and the black bat symbol. Your new Batman winter hat is made from 100% acrylic and is one size fits most and that means that it will look great on both men and women. 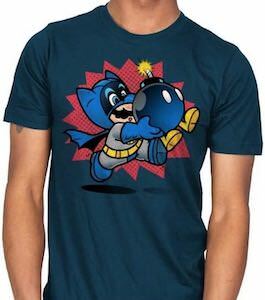 I think Batman played to many video games as this Batman as Super Mario t-shirt makes it looks like the Dark Knight changed into Mario. This men’t t-shirt is available in sizes Small – 4XL and it comes in many colors. And as you can see Mario looks like the typical Nintendo plumber only this time he is dressed as Batman in his gray and blue costume and he has gloves on and that is perfect as he is running around with an active bomb that could explode any moment now. This is just a fun t-shirt for Batman fans that like video games. Now there is a Batman logo and tree Christmas sweater. Batman fans can now have their own ugly Christmas sweater and this one is pretty nice. The black Christmas sweater shows the Batman logo on the top half and it is surrounded by snowflakes and the lower part is yellow within one band the Batman logo and Christmas trees and a banner below shows white snowflakes. You can get this Batman sweater in men’s sizes Small – 2XL and is made from 60% cotton and 40% polyester. So get ready for Christmas by dressing up in style. Fellows! If you want the advantage in being ridiculously good looking.. or if it’s your turn up to bat to gift your groomsmen.. they will look perfectly sharp sporting these DC approved, Batman cape silhouette silver cufflinks! Great to add a splash of geek chic to any fancy affair! The clean shape of this jewelry (the outline of the Bat’s majestic cape) looks so great, even a blind person could feel their power! 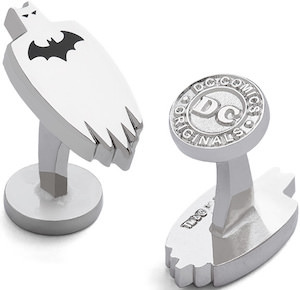 With a fixed back closure (the DC comics logo) they will not fall off, and they are a sturdy build composed of rhodium plated (a rare hard metal being member of the platinum group) base metal with enamel. Subtly flaunt your dark capricious alter ego and look great doing it! Girls will come a running just as fast as they can when you add this paired Batman accessory to your sharp dressed plan.